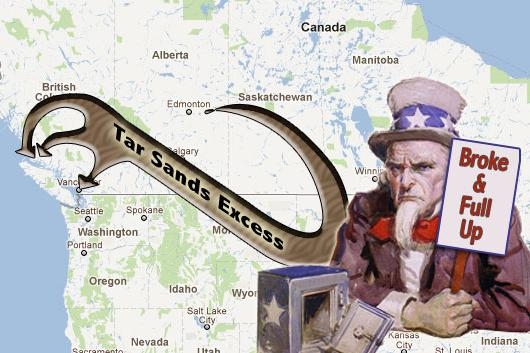 Americans are in deep trouble and their years of absorbing the tar sands growing production are over. This is a two part series. In today’s first part we explore the dramatic decline in American oil imports that set the stage for the Keytsone XL pipeline protests and delay. Tomorrow’s second part will explain just what that means for Vancouver and BC as a proposed string of gigantic tar sands pipelines heads for our coast. The happy storyline running for years now in Canada is that Americans benefit from buying more tar sands oil: Americans need more oil, and reliable Canada has lots to sell. 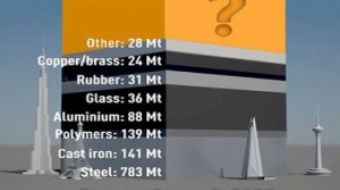 Big Tar has been ramping up carbon extraction for years, and Americans have been sucking it all up. America’s Big Gulp has allowed the Alberta tar sands to rapidly expand without really bothering the rest of us Canadians with their mess. But not anymore. Three dramatic things have shifted for Americans. The rapid doubling in oil prices has made importing oil economically disastrous for America. In 2005 Americans paid an average of $40 per imported barrel. By 2010 they were paying $74 and today the price hovers around $100. When you are the world’s largest oil importer that hurts big time. In response the Americans have gone into crisis mode, cutting nearly a Keystone XL worth of oil imports every year. Half of that came from a rapid 16 per cent increase in domestic production, and half from a 9 per cent decrease in demand. In just five years the USA slashed oil imports by 25 per cent, cutting off the import flow equal to four Keystone XL pipelines. Yet despite importing a billion barrels less oil than just five years ago, the rise in oil prices means Americans had to pay an extra $74 billion. America’s oil imports fell 25 per cent but their bill actually surged 40 per cent -- to $256 billion. At that rate a trillion dollars will leave their country every four years. They are bleeding dollars much faster than they can cut their oil import addiction. Now imagine that five year trend happening once more. Pulling out the stops they manage to slash imports by another 25 per cent, shutting down the flow equal to three more Keystone XL pipelines. But if oil rises at the same rate they will owe $360 billion. Down the rat hole they go. 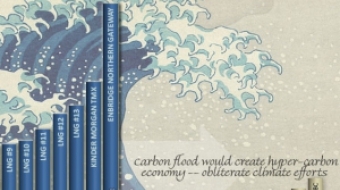 This is what a popping carbon bubble looks like to those that are invested in expensive high-carbon infrastructure. 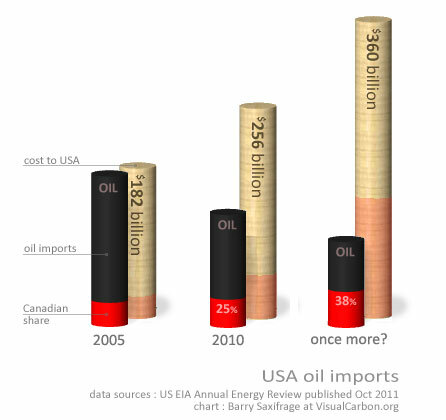 Obama could never have delayed the Keystone XL if Americans really needed to import more oil. They don’t. Just the opposite. For obvious national security reasons, America is very careful to not put all their oil import eggs in any one basket. 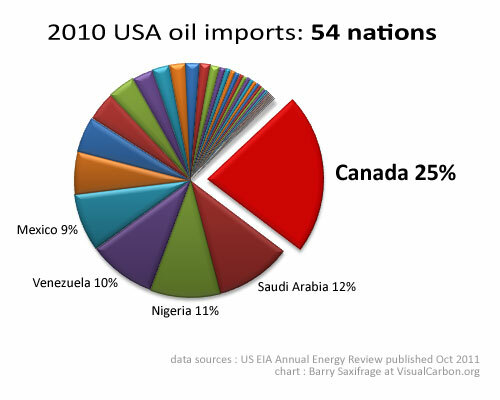 As the chart below shows they spread their oil imports out over 54 nations. What jumps out of the chart, however, is the huge share now supplied by Canada – a modern record for any USA oil supplier of 25 per cent. Just five years ago Canada supplied 16 per cent. The push to buy Canadian oil has been so successful that Canada has zoomed past all national security oil supply limitations that the Americans have maintained for decades. 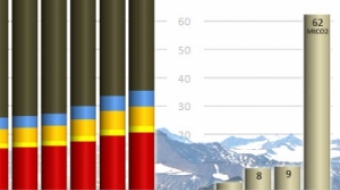 In sheer volume, America relies on Canada for nearly a billion barrels. Even without new pipelines, Canada’s share will soon surge to between 33 per cent and 50 per cent. How likely is it that Americans will opt for even deeper dependence on Canada than they are already signed up for? It depends how long their memory is.